Temperature measurement stations have been installed at various locations across the globe. The number of temperature monitoring stations is decreasing and many areas across the globe do not have any temperature monitoring stations. Consequently, average surface temperature is an unreliable metric for assessing global temperature trends. Computer models are used to analyze data sets. In science and engineering (and this paper) the term “data” refers to actual physical measurement at a point in time and space. In some temperature data sets, however, computer simulated values have been added in or data may have been arbitrarily adjusted long after the physical measurement was taken. Such practices undermine the credibility of the data set. Computer generated values are estimates, projections, or simulations and are of a different quality than physical measurements. Physical measurements represent a physical quantity whereas computer simulations represent numerical calculation. The HADCRU, GISTEMP, and NOAA surface temperature archives rely on the same underlying input data and therefore are not independent data sets. Limitations of the GHCN affect all data sets. Sampling discontinuities, urbanization and land use changes have decreased the quality of GHCN data over time. Differences in data processing methods between research teams do not compensate for poor underlying data quality inherent in the GHCN data. A similar situation exists with historical Sea Surface Temperature (SST) data sets which are derived primarily from the International Comprehensive Ocean-Atmosphere Data Set (ICODADS). Computer simulations involve mathematical models implemented on a computer imitating one or more natural processes. Models are based on general theories and fundamental principles, idealizations, approximations, mathematical concepts, metaphors, analogies, facts, and empirical data (Peterson, 2006, Meehl et al., 2012). Judgments and arbitrary choices must be made in model construction to apply fundamental laws to describe turbulent fluid flow. The large size and complexity of the atmosphere prohibit the direct application of general theory. In general, ensemble model forecasts have been found unreliable for long-term climate prediction (Green and Armstrong, 2007, Mihailović et al., 2014). “The forecasts in the [IPCC] Report were not the outcome of scientific procedures. In effect, they were the opinions of scientists transformed by mathematics and obscured by complex writing. Research on forecasting has shown that experts’ predictions are not useful in situations involving uncertainly and complexity. We have been unable to identify any scientific forecasts of global warming. Claims that the Earth will get warmer have no more credence than saying that it will get colder.” – Green and Armstrong, 2007. The global atmospheric system is dynamic and is constantly in a state of change and adjustment. The sun is the primary climate change driving force. Using a Climate Sensitivity best estimate of 2°C, the increase in [global] temperature resulting from a doubling of atmospheric CO2 is estimated at approximately 0.009°C/yr which is insignificant compared to natural variability. CO2 is a non-toxic trace gas constituting approximately 0.04% of the earth’s atmosphere. The global atmospheric concentration of CO2 increased from a pre-industrial value of about 280 ppmv to 379 ppmv in 2005 . The average CO2 concentration at the monitoring station at Mauna Loa, Hawaii for May 2017 is 409.65 ppmv. A rising concentration of atmospheric CO2 will contribute to warming of the Earth’s atmosphere. The physics of CO2 in the atmosphere is very different than the physics of the heating effect occurring in a physical “greenhouse” for growing plants. The term “greenhouse effect” is commonly used to refer to the warming of the earth from “greenhouse” gases such as CO2 in the atmosphere. The term “greenhouse” is not used here to refer to the Earth’s warming to avoid equivocation. Estimates of climate sensitivity differ widely suggesting that this characteristic of the climate system is not well-understood (Schwartz et al., 2014). A simple model predicts that a doubling of the CO2 concentration in the atmosphere would result in a small increase of the Earth’s surface temperature, from approximately 0. to < 0.7°C (Kissin, 2015). A best estimate of 2.0°C (Otto et al., 2013) is assumed here. If CO2 increases at the current rate of approximately 2 ppmv per year, a temperature increase of approximately 0.009°C/yr could be expected. To date the impact of CO2 is assessed universally within a global reference frame. Although atmospheric CO2 has steadily increased the average satellite global temperatures have flattened since approximately 1995. 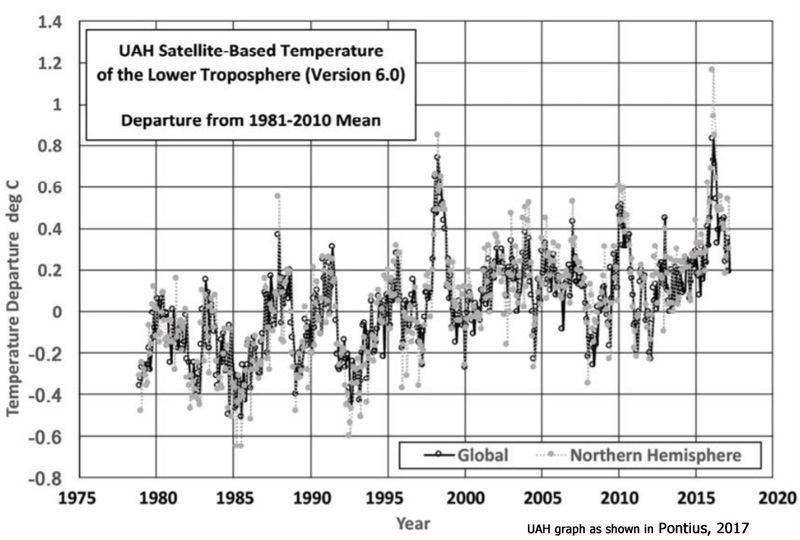 From such trends, it must be inferred that changes in global lower troposphere average temperature correspond to fundamental changes in the climate system beyond internal variability. The impact of future atmospheric CO2 warming on the Riverside locational reference frame must be estimated. GCMs [climate models] could be applied to project future global temperatures and those projections could be downscaled to the Riverside area. However, such efforts would be potentially misleading because of the limitations of GCMs discussed previously. Detailed assessments of the CO2 effect have been performed analyzing the Earth’s energy balance in the total atmosphere column and the reduction of the upward infrared radiation emission at the tropopause. The impact of CO2 on warming of the Earth is expressed in terms of “climate sensitivity,” which is the amount of warming that could be expected as a result of doubling of the CO2 concentration. 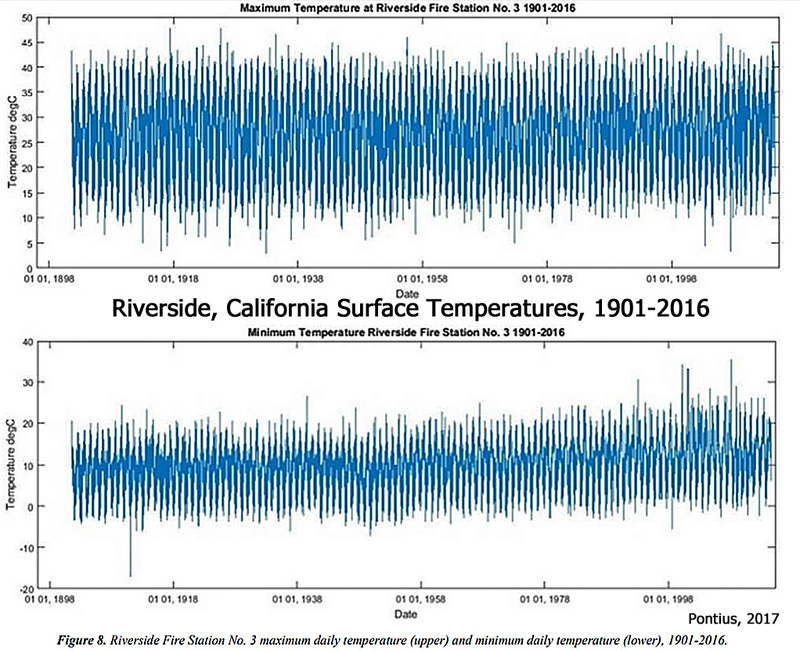 Available temperature data from both the Riverside Fire Station No. 3 and the Riverside Municipal Airport demonstrate horizontal trends within a wide band of variability. Historical evidence of a significant increase in surface temperatures due to increases in atmospheric CO2 is absent from these data. [C]limate models are useful but limited in their representation of underlying physical processes. 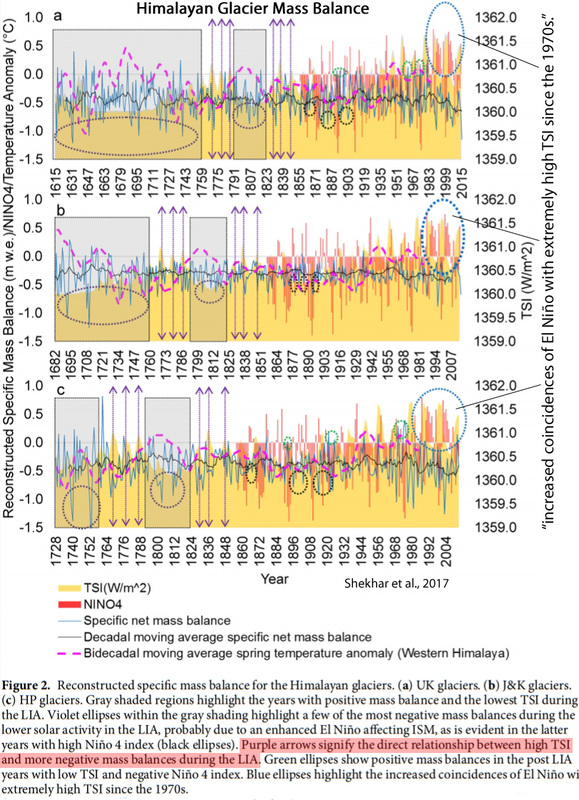 Uncertainties and other limitations discussed previously render such models unreliable for long-term global temperatures or local climate change prediction. Climate sensitivity may be applied to estimate the warming effect of CO2 on the locational reference frame. Factors affecting Climate Sensitivity are not well-understood and estimates differ among researchers. Alternatively, a site-specific model could be developed to estimate the future impact of CO2 warming on a particular location. If atmospheric CO2 continues to increase at its current rate the small annual temperature increase expected at Riverside will likely be insignificant (e.g. < 0.01°C/yr) compared to natural temperature variability. A slight increase in minimum daily temperature is noticeable at Riverside Fire Station No. 3 after 1998 (Figure 8, lower) with a corresponding slight decrease in the daily temperature range (Figure 9). This trend is most likely due to the urban heat island effect (Tam et al., 2015) resulting from increased development within and around downtown Riverside over this extended period. I was just reading, on Zero hedge, about Elon Musk’s plan to colonize Mars. Seems somewhat ironic that anthropogenic influence on earth is deemed devastating, but on Mars it will be deemed necessary, and a good thing. Not to mention, everything needed to sustain life on Mars would have to come from Earth. Civil engineers have to deal with the world as it is and design for the worst plausible loads on the structures they build. This, like hanging, concentrates the mind. Some jurisdictions put you in jail if your creation fails and then start investigating the reasons and your guilt or otherwise. This generally has good effects on the honesty and reliability of civil engineers although not all (Yeltsin, Arafat). It might help if a similar system applied to climate modellers. Still no explanation of how CO2 gas molecules in the atmosphere warm anything. It is quite clear CO2 molecules can radiate through the 13 to 17 micron bands. Problem is slightly less than half that radiation reaches the surface. Next problem is slightly more than 70% of the earth’s surface is water!!! That radiation, long wave IR, does not penetrate water by more than a millimetre or so. The surface water molecules do become excited and tend to break away, the departing water molecule takes energy away from the water surface. A bit like sweating. A cooling effect. As for radiation from CO2 molecules in the atmosphere warming the land is simply impossible. Radiation over the 13 to 17 micron bands will only warm up material colder than -30C. Do look up the science. It is all there. Richard111, he’s not trying to explain the observed temperature increase due to CO2 (the explanation is well known anyway), he’s trying to deny it. If you are looking for an explanation in a blog post on “No Tricks Zone”, you are looking in the wrong place. Incidentally, the low transmittivity of water to infrared is due to high absorption, which means the IR radiation warms the surface of the water. A joule is a joule, so that absorbed energy will partially spread through the water via conduction, and partially return to the atmosphere. Of the part returned to the atmosphere, not enough returns to space, and the water warms until the atmospheric effect is overcome and a new equilibrium is reached in which a sufficient amount does reach space. “Radiation over the 13 to 17 micron bands will only warm up material colder than -30C” — is simply false. Any radiation striking a material is reflected, absorbed, and/or transmitted in various proportions. Any absorbed portion warms the material, regardless of the material’s original temperature. This follows from the First Law of Thermodynamics (do look it up). Land doesn’t transmit LWIR and is a poor reflector in that spectral range. So guess what? It’s almost all absorbed. the IR radiation warms the surface of the water. By the way, the direct shortwave heat energy is what warms the cool “skin” layer. And now take the sentence you emphasized and imagine what happens when the upward longwave flux changes … and that is what an increasing GHE does. It decreases the upward flux. that is what an increasing GHE does. It decreases the upward flux. Why was my reply to this deleted? It was a valid question to confirm that Kenneth indeed understood the concept because he just replied evasively or if this is – again – an artifact of his way to comment (through the admin UI of WordPress). Please stop whining about having to re-post a comment. Save your work and re-post like others have to. Does your comment contain the ad hominems and personal insults they so often do? A joule that is absorbed in a short depth increases the internal energy of an object as much as a joule absorbed over a greater depth: by exactly one joule in either case. The distribution is different. The radiation striking the solid ground, both solar and infrared, is also absorbed in a very short distance. Yet it warms the ground very effectively. Uh, yeah, the distribution is not only different for SW vs. LW, the distribution difference is effectively the determinant of the temperature of the 0-2000 m layer of the oceans. We’re talking about impacts here. A hand shovel vs. a bulldozer. Which makes more of an impact on the size of a hole in the ground? Just because a liter of dirt removed by a shovel is the same as a liter of dirt removed by a bulldozer doesn’t mean the impact of using a bulldozer is equal to the impact of using a hand shovel. Seems like you’re saying that it makes no difference that LWIR cannot penetrate past the 0.1 to 1 mm “thick” ocean skin, whereas SW radiation can penetrate 30 meters into the ocean. I assume you’re saying that variations in factors affecting SW vs. LW are therefore equal in terms of their impact on ocean temperatures. Is that what you’re saying? Do you agree that the greenhouse effect of clouds may be 100 times more potent than CO2 in determining ocean temperatures, or that clouds easily override CO2 within the greenhouse effect and may explain why the greenhouse effect went on hiatus during 1992-2014? If not, why not? Just because a liter of dirt removed by a shovel is the same as a liter of dirt removed by a bulldozer doesn’t mean the impact of using a bulldozer is equal to the impact of using a hand shovel. You really need to practice your analogy game, Kenneth. Of course it is the same impact when the same amount of dirt was removed. A Joule is a Joule, it doesn’t contribute more to the heat content when it is distributed over a greater volume. That 1989 paper concluded that clouds (all of them) have a net forcing of -13.2 W/m², meaning they cool the planet. The author then writes that this figure is 3-5 times larger than the 4 W/m² resulting from a doubling of the CO2 concentration. So what does that mean? If the cloud cover was reduced by 20-33% it would cancel out the CO2 effect. Did it decrease by that much from the 1980s? No, it didn’t. So what is the point of you repeating that a single cloud in the tropics (at day) has for itself a 100-times greater GHE than a doubling of the CO2 concentration? Wow, your figures are really off (again), SebastianH. According to textbook science, a change in cloud cover of just 3%, not 20-33%, is enough to rival the entire radiative forcing alleged from atmospheric CO2 since 1750. In your first quote 1.7 W/m² from 3% cloud cover change would mean the total net effect of the cloud cover is around 56 W/m², in case of 0.8 W/m² it is around 26 W/m². Ok, different totals then before, but let’s assume those are correct. Did the cloud cover actually change by 3% since the 1980? Can you find an accurate graph that says it was maybe 60% of the sky in 1980 and now it’s around 58%? And will it stay at 58% long enough so that would actually equal an average forcing of 1.56 W/m² (i wrote 4 W/m²)? “My” figures aren’t off and if they were then blame your sources (I took them from there). The second quote in your reply isn’t about the whole globe and therefore a distraction (again). Can you find an accurate graph that says it was maybe 60% of the sky in 1980 and now it’s around 58%? It really is pointless to try to educate you on cloud radiative forcing. It’s not worth it to me to try it out again. Because it would show how lost you are with anything that is more complex than basic calculus? No, SebastianH, you consistently demonstrate that you do not understand how cloud radiative forcing works. Very simply, the shortwave effects of cloud cover changes dominate over the longwave effects of cloud cover changes, which means that a reduction in clouds will cause warming even though a reduction in longwave will occur as a consequence of the reduction in cloud cover, which would, in the absence of the SW effect, theoretically cause cooling. Your attempts to “calculate” cloud effects using a concocted -18 W m-2 “formula” are ridiculously wrong. But you go right on ahead and continue embarrassing yourself. It’s not as if I could stop you anyway. The changes in both satellite derived and measured surface insolation data are also in line with changes in global cloudiness provided by the International Satellite Cloud Climatology Project (ISCCP) … Over the period covered so far by BSRN (1992 to 2001), the decrease in earth reflectance corresponds to an increase of 6 W m-2 in absorbed solar radiation by the globe. The overall change observed at the BSRN sites, estimated as an average of the slopes at the sites in Fig. 2A, is 0.66 W m-2 per year (6.6 W m-2 over the entire BSRN period). which means that a reduction in clouds will cause warming even though a reduction in longwave will occur as a consequence of the reduction in cloud cover, which would, in the absence of the SW effect, theoretically cause cooling. Your attempts to “calculate” cloud effects using a concocted -18 W m-2 “formula” are ridiculously wrong. Apparently, you don’t understand that what I am saying is exactly this. But as you quote at the end shows you still don’t get what it means. If the current cloud cover causes an SW effect of -X and an LW effect of Y. Then we have a total effect of Y-X W/m² and from your the many papers you quote from this figure is somewhere between -13 and -21 W/m². This means that when the cloud cover decreases the negative forcing shrinks and it gets warmer. So far so good. But then you quote “an increase of 6 W m-2 in absorbed solar radiation by the globe” and completely ignore that a nearly as big decrease in LW forcing must have occurred when the cloud cover decreased that much. So the net forcing is maybe in the 0.x W/m² range. co2 doesn’t warm. It delays cooling, which leads to higher temperature. co2 can also make the ocean emit more water vapor. It’s just simple co2 physics. Did you not pay attention in class? And is there any example where the observed difference shows effects ((of this CO2 delay) in the convection dominated atmosphere? (As CO2’has risen from being an extremely, very rare gas, to an extremely rare gas in the atmosphere). As you say it’s ‘just simple co2 physics’. I don’t really want more hypothesis or surmises. Just a few observational records that show 100% any atmospheric warming happening because of CO2. Observations of atmospheric CO2 actually CAUSING something (real good honest science). And still 400 ppm or 0,04% does not make any difference at all. Only nature benefits from that as it recycles co2 to o2, oxygen! Observations? we got 1.2 degrees warmer since 1880. Only co2 explains this. There’s a video on youtube of a 9 year old kid doing an experiment with air vs. co2 trapped in a bottle. The co2 got hotter. A 9yo can figure it out! Why can’t you? Observations? we got 1.2 degrees warmer since 1880. Good now PROVE that is not a natural event of coming out of the LIA. Because that is ALL that happened, a NATURAL result of leaving the LIA. NOTHING to do with human’s and their very feeble industrialization. Industrialization that hardly leaves a mark on nature but which profoundly help humans. Sure tom, keep convincing yourself that it’s because of coming out of little ice age. Pure speculation. The coming out would have reverted back to coldness, if not for the co2 emissions. You just assumed what you wished. Where is your evidence that the coming out was DESTINED to continue anyway? You have none. Sure tom, keep convincing yourself that it’s because of coming out of little ice age. Pure speculation. The Little Ice Age was associated with centennial-scale very low solar activity and high volcanic activity, which leads to cooling. During the 20th century and until just recently, the Earth’s inhabitants have enjoyed some of the highest levels of solar activity since the Medieval Warm Period and a dramatic reduction in volcanic activity, preventing cooling. These trends are well documented in hundreds of scientific papers that have been published in the last few years alone. Here are just a handful (~80) from 2017. Read the papers carefully and then reply with something substantive, please. 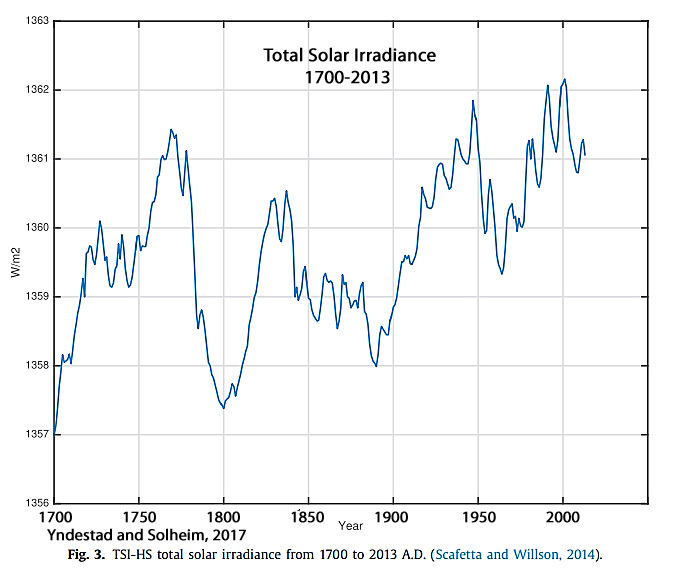 No solar trend in 260 years! Who do you think you’re fooling with your fake data? So at what point did peer-reviewed scientific papers become “absolute rubbish” and “fake data”? When they revealed something you disagree with? 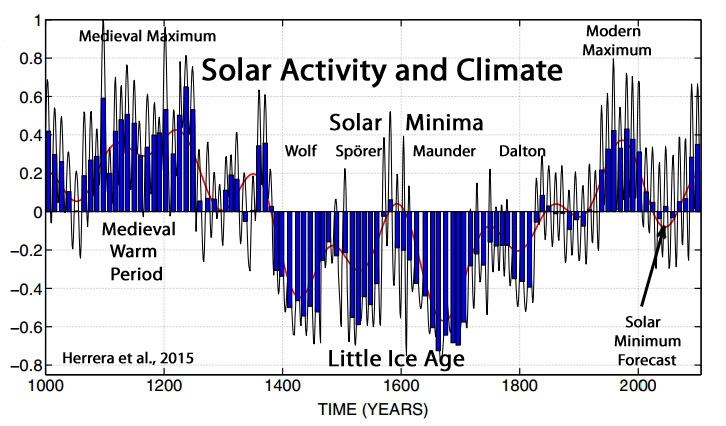 Below are about a dozen graphs of solar activity taken from peer-reviewed scientific papers showing widely varying solar activity, including the Modern Grand Maximum for the 20th century and the solar minima that characterized the Little Ice Age. My data comes from observations. Yours comes from fantasy land. 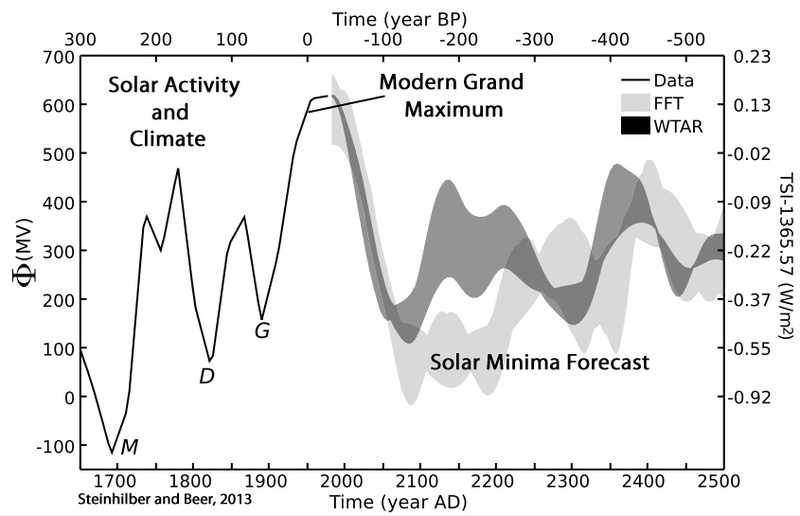 One of the charts shows carbon-14, but labels it “solar activity”. Unbelievable! Your psyentists are just making up solar data to fit their agenda. 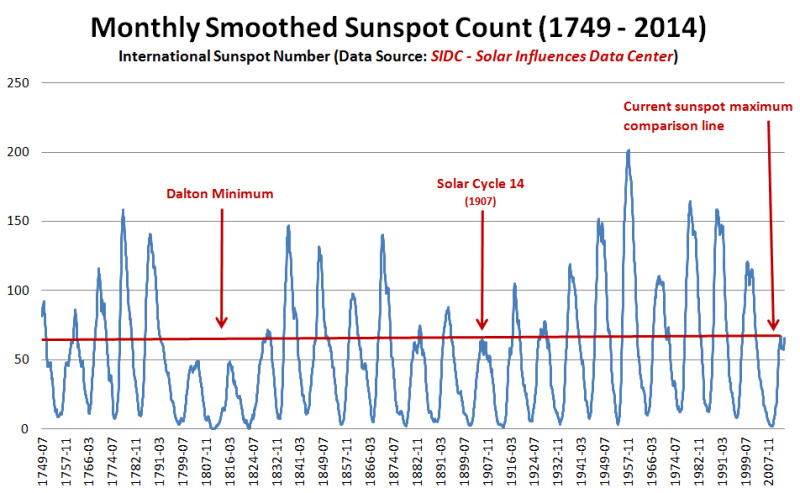 I’ll stick with the validated sunspot data, and avoid the competion of made-up paleo solar TSI. My data comes from observations. Yours comes from fantasy land. How old are you, Consensus? 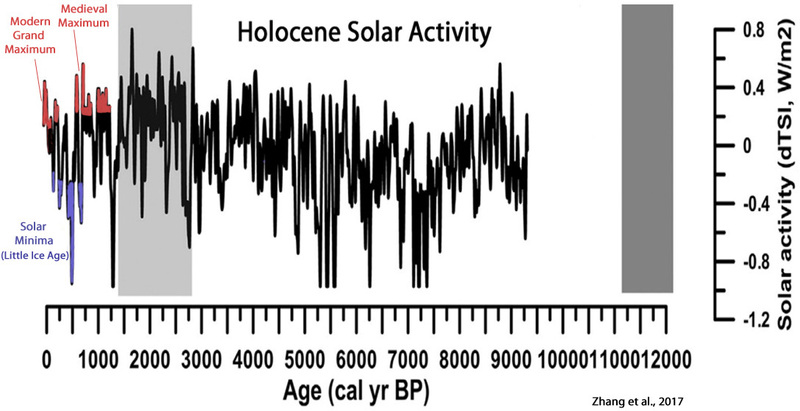 One of the charts shows carbon-14, but labels it “solar activity”. Unbelievable! Will there be a point at which you decide to stop embarrassing yourself? When the activity of the sun changes, it has direct effects on the earth. For example, when the sun is relatively inactive, the amount of a type of carbon called carbon-14 increases in the earth’s atmosphere. Because carbon in the air is absorbed by trees, carbon-14 levels in tree rings actually reflect solar activity and unusual solar events in the past. You haven’t debunked my chart, because you know yours are fake “reconstructions”. Sure Ken, the sun manufactures carbon-14. Or maybe carbon-14 drives the sun. LOL. The scientists who use C14 variance as a proxy for solar activity from the paleoclimate have written neither one of the ridiculous statements you just made up as cover for the fact that you had/have absolutely no idea what you’re talking about. 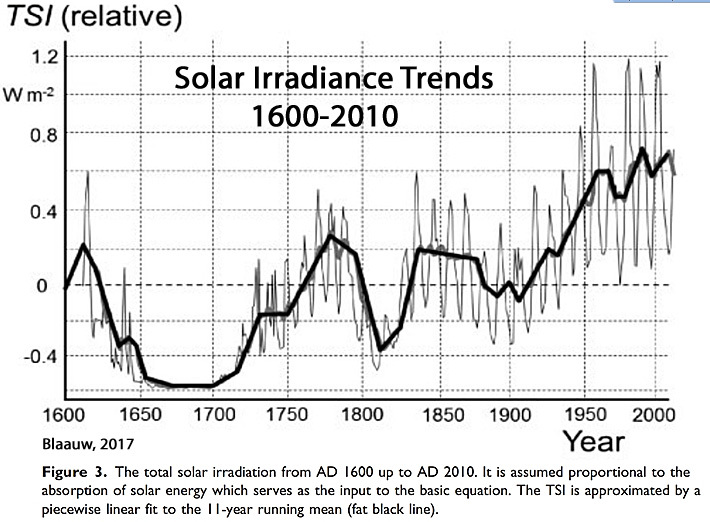 The cited reconstructions of solar activity published by solar scientists in scientific journals do not become “fake” just because they do not happen to align with your beliefs. And my answer to him was he does not understand CO2 or our planet’s atmosphere. He can not fathom how fast the absorption/re-radiation of IR radiation is. It ensures that on the stunningly rare occasion it happens it is so just so fast. And that a fine renaming ‘Scienceless Consensus’. Kool Ade doesn’t exist. Spelling is so hard for deniers. Tom doesn’t understand that there’s more than one co2 molecule and that they all absorb/re-emit multiple times over. He needs to read a real scientific source like American Chemical Society. They explain how co2 traps heat – a concept that’s been around for 160 years, but deniers deny. Please stop feeding this troll who is the weakest I have ever seen. Heck, this troll does not even understand that “consensus science” is anti-scientific political contradiction in terms. Eaeth goes around the sun. Consensus Science. According to trolls, this is a political statement! What rubbish. I said “temperature increase due to CO2”. You said “leads to higher temperature”. Tomato, tomato? Maybe *you* weren’t paying attention. Oh, my bad,you were replying to Richard111. The actual rate of increase is about 2.3 (not 2) ppmv/year, which represents about 0.57% per year. According to the rule of 72, it will therefore take 126 years for CO2 to double. 2 degrees C in 126 years is 0.01585 deg C per year or 0.1585 deg C per decade. This matches the observed rate of warming very well. There seems to be an erroneous assumption in the article that an increase of 2 ppmv/year means atmospheric CO2 will double in 200 years, and that this doubling time is therefore valid for purposes of the calculation. While we don’t know whether the rate of increase will stay the same, increase, or decrease, the fact that we are dealing with a logarithmic response (constant increase in response to each doubling) means that any calculation to find the current instantaneous rate of temperature increase must be made on the assumption of a time-exponential stimulus. Why? If y = k log x, then dy/dt = (k/x) *(dx/dt) (by the chain rule), and with that equation, constant dy/dt results if x is an exponential function of t. If x = me^(nt), then dx/dt = mne^(nt) = nx, and dy/dt = kn (constant). And suppose the 2.3 ppmv/year did stay constant for 200 years. Or rather, 174 years (400/2.3). Then we’d get 2 degrees increase after 174 years. However, the rate of increase would start off at 0.57% per year, yielding the 0.1585 C/decade that I calculated above. But in year 174, the rate of increase is 0.28% per year, giving a warming rate of around 0.079 C/decade. The average rate over that period of time will be 0.115 C/decade, but with linear CO2 increase, the temperature increase, while taking longer than the exponential case, is obviously front-loaded. If we assumed 0.115 C/decade for the current rate, using the author’s method, then the decline in the warming trend over time means we would fall short of the initial assumption. Thus, the failure of the author’s method is demonstrated. And suppose the 2.3 ppmv/year did stay constant for 200 years. Or rather, 174 years (400/2.3). Then we’d get 2 degrees increase after 174 years. That’s assuming that the Otto et al. (2013) estimate for CO2 climate sensitivity (2.0 C) is accurate and that the ~65 papers that have climate sensitivity at well less than half of that value (0.02 C to 1.0 C) are inaccurate. It also assumes that all the other factors that much more strongly influence changes in Earth’s temperature (i.e., decadal-scale cloud cover variations) will remain constant, or that they will not exert any influence on Earth’s temperatures. Cloud radiative forcing, for example, exerted ~2.5 W m-2 of forcing on Earth’s temperatures during 1979-2011, which is a significantly greater forcing than alleged from CO2 over that span. But in year 174, the rate of increase is 0.28% per year, giving a warming rate of around 0.079 C/decade. … Thus, the failure of the author’s method is demonstrated. I would suggest that the failure of your method of determining the temperature of the Earth 174 years from now based solely upon a parts per million (0.000001) variation in an atmospheric trace gas…is profound. The Earth’s oceanic temperatures have varied by + or – 1.0 C per century in the 0-1000 m layer — without any significant CO2 concentration changes — during the Holocene. In contrast, the ocean temperatures have been estimated to have increased by just 0.09 C between 1955 and 2010 despite substantial increases in CO2 during this time. This would not appear to be consistent with the presumption that CO2 concentrations are dominant factors in ocean temperature variations. More recently, or during the last 110 years, the near surface (0-20 m) ocean temperatures warmed by about 1.3 C between 1900-1945, but only about 0.3 C total since then, or during the next 65 years. Considering CO2 emissions from humans were essentially flat between 1900-1945, but then exploded from 1 GtC/yr in 1945 to 10 GtC/yr by 2016, the trends suggest that ocean temperatures warmed at a much greater magnitude and at a much faster rate when CO2 emissions were flat than when CO2 emissions were exploding. How is this consistent with the perspective that CO2 emissions from humans are so determinative and dominant that we can determine what the temperatures will be 174 years from now with an accuracy that allows commentators like you to discuss the “failure” of an author’s analysis when your own analysis rests upon assumption after presumption after presupposition? Kenneth, an increase of X W/m2 of solar energy reaching the surface is not a net forcing, no matter how often you repeat this. It’s not just reaching the Earth’s surface, it’s an increase in SW radiation via cloud RF being that is absorbed by the surface…or, more precisely, the Earth’s oceans. The increase in solar energy absorbed by the Earth’s oceans since satellites began monitoring can better account for the warming trend than can the tiny change in CO2 concentration. Regarding your claim that the decadal-scale change in cloud cover is not a net forcing, there is quite a bit of evidence to suggest that you’re wrong. The net shortwave forcing of the Earth’s climate is determined by the solar output and the Earth’s albedo or reflectance. … Traditionally the Earth’s reflectance has been assumed to be roughly constant, but large decadal variability, not reproduced by current climate models, has been reported lately from a variety of sources. There is a consistent picture among all data sets by which the Earth’s albedo [cloud cover] has decreased over the 1985-2000 interval. The amplitude of this decrease ranges from 2-3 W/m2 to 6-7 W/m2 but any value inside these ranges is highly climatologically significant and implies major changes in the Earth’s radiation budget. Don’t ignore the resulting LW forcing change when cloud cover changes. The increase in SW radiation reaching the surface is not the net effect of such a change. And a cloud cover change is the result of what exactly? Do you still believe it is cosmic rays that control the cloud cover? Don’t ignore the resulting LW forcing change when cloud cover changes. And a cloud cover change is the result of what exactly? Do you still believe it is cosmic rays that control the cloud cover? 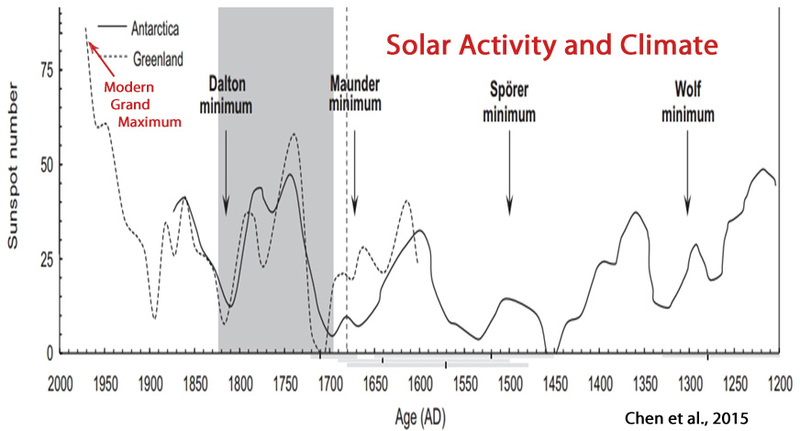 The 11 yr solar cycle, also known as Schwabe cycle, represents the smallest-scaled solar cyclicity and is traced back to sunspot activity (Douglass, 1928; Lean, 2000), which has a measurable effect on the Earth’s climate, as indicated by the Maunder minimum (Usoskin et al., 2015). Global climate feedback reactions to solar irradiance variations caused by sunspots are complex and hypothesized to be triggered by (1) variation in total energy input (Cubasch and Voss, 2000), (2) the influence of ultraviolet light intensity variation on composition of the stratosphere (Lean and Rind, 2001), (3) the effect of cosmic rays on cloud formation (Marsh and Svensmark, 2000; Sun and Bradley, 2002), and/or (4) the effect of high-energy particles on the strato- and mesosphere (Jackman et al., 2005). … [L]ike today, sunspot activity caused fluctuations of cosmic radiation input to the atmosphere, affecting cloud formation and annual rates of precipitation. 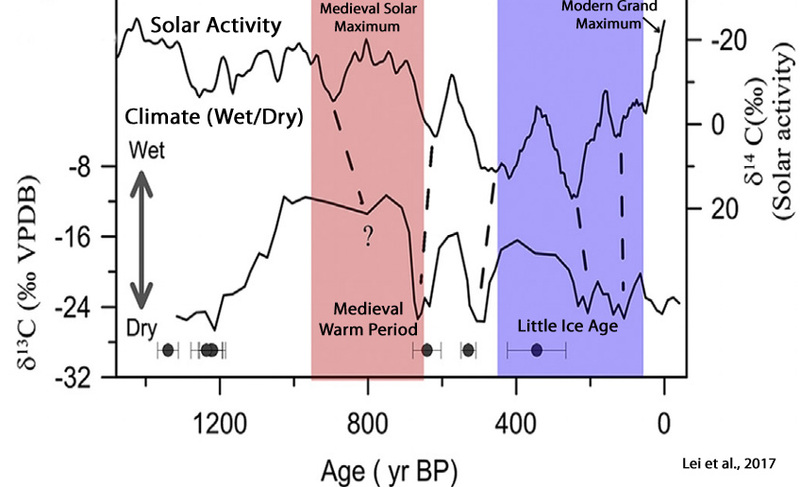 The effects of total solar irradiance (TSI) and volcanic activity on long-term global temperature variations during solar cycles 19–23 [1954-2008] were studied. It was shown that a large proportion of climate variations can be explained by the mechanism of action of TSI [total solar irradiance] and cosmic rays (CRs) on the state of the lower atmosphere and other meteorological parameters. … Recent studies by Pudovkin and Raspopov, Tinsley, and Swensmark have shown that the Earth’s cloud coverage is strongly influenced by cosmic ray intensity. Conditions in interplanetary space, which can influence GCRs and climate change, have been studied in numerous works. As has been demonstrated by Biktash, the long-term CR count rate and global temperature variations in 20–23 solar cycles [1960s-2000s] are modulated by solar activity and by the IMF (interplanetary magnetic field). Oh yes it has. Remember the time when you posted papers that said the net forcing of cloud as a whole was something around -21 W/m²? So when the cloud cover gets reduced by just a few percent, the net effect of the remaining clouds can’t change by 2-3 W/m² to 6-7 W/m². So yes, you ignore that. The papers you quote specifically only mention SW forcing. A survey is made of the evidence for and against the hypothesis that cosmic rays influence cloud cover. The analysis is made principally for the troposphere. It is concluded that for the troposphere there is only a very small overall value for the fraction of cloud attributable to cosmic rays (CR); if there is linearity between CR change and cloud change, the value is probably ∼1% for clouds below ∼6.5km, but less overall. The apparently higher value for low cloud is an artifact. The contribution of CR to ‘climate change’ is quite negligible. After all these repetitions and attempts to educate you, you still don’t understand cloud radiative forcing. I won’t attempt it again. So when the cloud cover gets reduced by just a few percent, the net effect of the remaining clouds can’t change by 2-3 W/m² to 6-7 W/m². So you’re suggesting that all these scientists publishing all these papers have consistently got it wrong when it comes to the net positive forcing from the cloud cover reduction since the 1980s? You know better than they do, huh? Regarding cosmic rays, there is a great deal of debate about the extent to which they influence cloud cover changes. A single paper won’t settle it. I can provide links to many papers that say the opposite of the single paper you linked to. Please consider that you got it wrong, after all the other math and physics mistakes/misinterpretations of yours. That’s not what I wrote. I wrote that you ignore what they are writing and assume that those 2-7 W/m² are a net forcing. If they were then the cloud effect would have been reduced by up to 33% (from -21 W/m² to -14 W/m²) since the 80s (or by taking another paper you quote from into account from -13.2 W/m² to – 8.8 W/m²). Is that the case? A single paper won’t settle it. I can provide links to many papers that say the opposite of the single paper you linked to. It was the author who chose the figure for climate sensitivity. I merely showed that he did the calculation incorrectly. Incidentally, 2 degrees per doubling is a figure for sensitivity with feedback. 1 degree per doubling is generally accepted for transient sensitivity without feedback. The current rate of increase (the trend of the last 40 years) is close to what you get with 2 degree sensitivity,so the author’s choice seems sound enough. Of course, given that natural forcings seem to be in overall decline,perhaps a larger feedback sensitivity needs to be assumd to explain the trends. From what starting point are you “selecting” for your trend? If we go by the last 30 years (a requisite for climate change indicators) the trend is less than 2 ppmv/yr during this span. 2 degrees C in 126 years is 0.01585 deg C per year or 0.1585 deg C per decade. This matches the observed rate of warming very well. This matches the observed rate of warming very well. No, not really. And even if there was a robust correlation, this would not necessarily mean that CO2 was the cause of the temperature changes. After all, you do realize that the models say that a surface temperature increase limit for a doubling of CO2 concentration from 280 ppm to 560 ppm is just 1.16°C at most. It’s already been 265 years (1750) since the IPCC alleges humans began raising CO2 levels, and we’re not even halfway to doubling to 560 ppm yet. Even assuming that it takes only 100 years to reach 560 ppm, we’re talking 365 years for a temperature increase of 1.16°C (the limit for temperature increases from CO2 concentrations alone per IPCC models), which is 0.0032°C/year, or 0.03°C/decade. 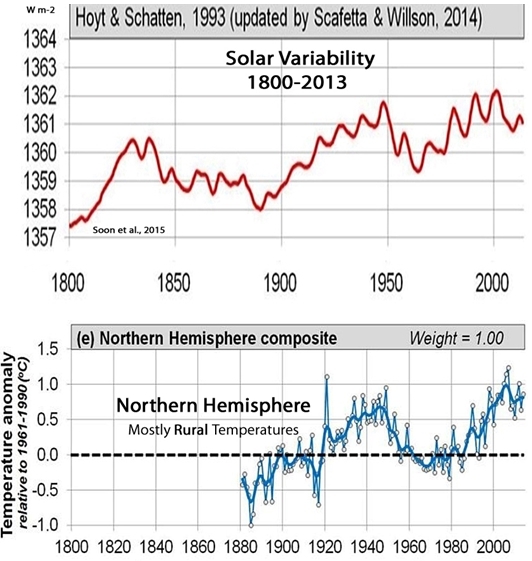 As Dr. Pontius points out, even 0.09°C per decade is still well within range of natural variability. A third of that rate is too, of course. Considering the globe has warmed (and cooled) by several times the rate of the last 165 years, it will first need to be established that there is something unusual occurring today that falls outside the range of natural climate change vacillations. This has not been established. Therefore, the exercise of pointing out Dr. Pontius’ “erroneous assumption” seems to miss the point. Why do you keep ignoring feedbacks and emphasize what scientists say about what the direct influence of CO2 might be? Is that so you can belittle the increase? Why do you keep ignoring feedbacks and emphasize what scientists say about what the direct influence of CO2 might be? Please define how much of the 0.78 C temperature increase since 1850 has been due to the feedbacks with water vapor and cloud cover vs. the attribution from CO2 concentration changes. Since the models say that, by itself, a doubling of CO2 concentrations from 280 ppm to 560 ppm (or 560 ppm to 1,120 ppm and so on) can only yield a temperature increase of 1.16 K, and the ECS from feedbacks with water vapor and cloud cover cause temperatures to rise by 3 to 6 degrees C more, it’s the feedbacks from water vapor and cloud cover that are believed (the IPCC uses that word) to cause the overall temperature to triple or quintuple. CO2 alone only causes a little more than a degree of warming (per the models). Since it is assumed that catastrophic warming of 3 to 6 C will occur due to feedbacks, surely there has already been some feedback effect from water vapor and cloud cover increases (?) that has been realized in the last 265 years. So what is that attribution for water vapor and cloud cover? Do you know? Or do you believe the 0.78 C has been caused by CO2 almost exclusively, and that the alarming warming from the water vapor and cloud feedbacks hasn’t “kicked in” and caused warming yet? The observed warming is not caused by CO2 exclusively, of course there are already feedbacks kicking in. There is also a delay. The temperature will not have increased by X degrees on the day the CO2 concentration doubles. That’s why it would continue to warm even if we could halt all CO2 emissions immediately. So what proportion of the 0.78 C warming since 1850 is from water vapor and/or cloud feedbacks? Be specific. Or don’t you know? I don’t know if Sebastian knows, and I don’t know. But roughly 2/3 is from the direct effect of CO2 (log2(400/280) = 0.51, so 0.51 C is from CO2’s no-feedback sensitivity). So about 0.26 C would be due to a combination of feedback and natural forcings. 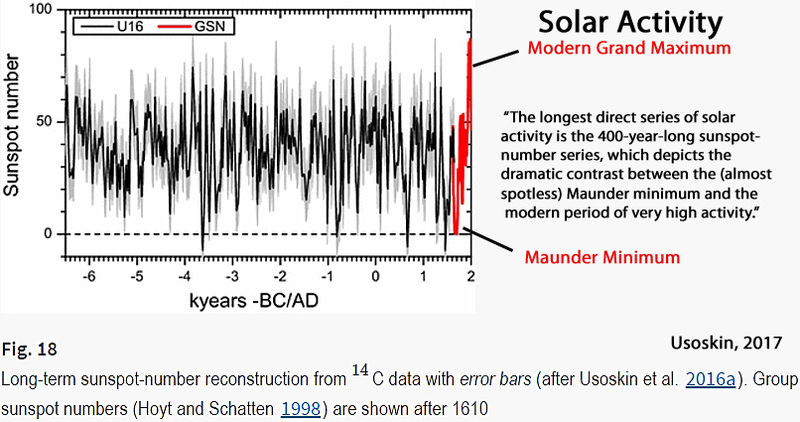 Of course, you have no observational evidence for this, as it’s only guesswork based upon modeled presuppositions that CO2 concentrations are the cause of ocean heat content variations, and that the 20th century’s Modern Grand Maximum of solar activity, the reduction in volcanic activity since the end of the high-activity Little Ice Age, and the reduction in cloud cover since the 1980s have exerted no influence on temperatures since the 1800s because these natural forcing factors have remained constant. Those are a lot of presuppositions for you to believe in, ScottM. 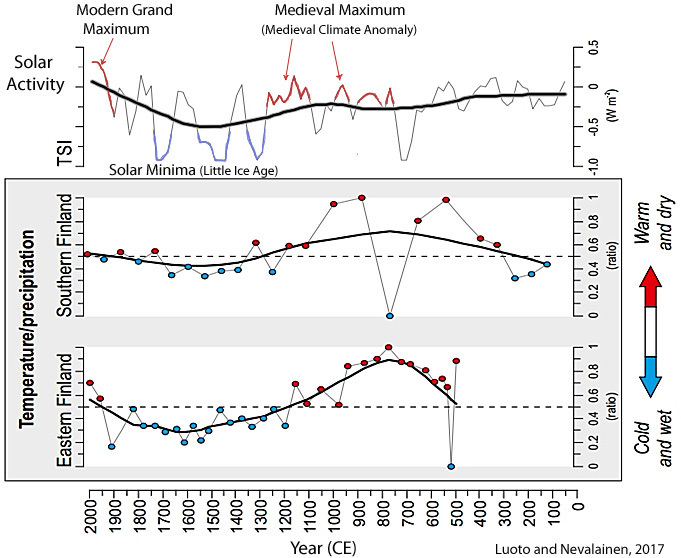 […]the 20th century’s Modern Grand Maximum of solar activity, the reduction in volcanic activity since the end of the high-activity Little Ice Age, and the reduction in cloud cover since the 1980s have exerted no influence on temperatures since the 1800s because these natural forcing factors have remained constant. Who says that those influences didn’t change? But they seem to be rather small, don’t you think? We can actually measure the effect all GHGs have. No, the measured effects of atmospheric CO2 concentration changes on thermal changes in the ocean have not been observed. They are not only guessed at using models and assumptions. The DWLR from clouds and water vapor are so much more dominant that an anthropogenic signal is lost in the noise. And considering the entire climate debate centers on detecting a clearly measurable anthropogenic signal in ocean heat content changes, the inability to “actually measure” the effects of CO2 on ocean heat renders conclusions regarding the anthropogenic influence on climate speculative at best. Sure, you have your beliefs and confirmation biases, but that’s all they are. Your question is a straw man stemming from the purposeful misrepresentation of what I actually wrote. My comment was clearly about the extent to which we are capable of divining future temperatures with only using the variation of one single atmospheric constituent, CO2, as the forcing factor. This assumes that all the other factors that much more robustly determine changes in ocean heat content (and thus climate) must necessarily be assumed to be (unrealistically) constant. It’s not reality to assume that changes in cloud cover, for example, will not change. After all, it is clouds, not CO2, that have the dominant influence on changes in the radiation budget. As in the prior studies, which were restricted to lower latitudes, there is a significant increase in the TOA outgoing longwave radiation during the period 1985 to 1999 together with an increase in solar (shortwave) radiation absorbed by the climate system. It is suggested that these changes are related to an observed reduction in cloud cover. It is widely assumed that variations in Earth’s radiative energy budget at large time and space scales are small. We present new evidence from a compilation of over two decades of accurate satellite data that the top-of-atmosphere (TOA) tropical radiative energy budget is much more dynamic and variable than previously thought. Results indicate that the radiation budget changes are caused by changes in tropical mean cloudiness. The DWLR from clouds and water vapor are so much more dominant that an anthropogenic signal is lost in the noise. the inability to “actually measure” the effects of CO2 on ocean heat renders conclusions regarding the anthropogenic influence on climate speculative at best. We can measure the radiation and you think that somehow this radiation has no effect or is nearly completely compensated by evaporation. Which makes no sense and borders on believing in magic. This assumes that all the other factors that much more robustly determine changes in ocean heat content (and thus climate) must necessarily be assumed to be (unrealistically) constant. It’s not reality to assume that changes in cloud cover, for example, will not change. See what you did there? I wrote that we can’t actually measure the effects of CO2 concentration changes on ocean heat, which is a true statement that even you have previously acknowledged, and you reply with “we can measure the radiation” and that I believe in magic because I “think somewhat this radiation has no effect”. This is a prototypical example of how you twist words, evade questions, concoct straw men, and generally behave dishonestly. This has nothing to do with me believing in magic. I’m just telling it like it is. True or false: We can measure the effect of CO2 concentration variations on ocean temperatures such that we can know precisely how much the oceans cool or warm as a consequence of increasing or decreasing CO2 concentrations by, say 10 ppm. It’s not reality to assume that changes in cloud cover, for example, will not change. Um, Sebastian, the climate models don’t even have cloud cover change data for the period prior to 1979. They can’t even agree whether cloud cover increases cause warming or cooling. There is a misconception that the major challenges in physical climate science are settled. “That’s absolutely not true,” says Sandrine Bony, a climate researcher at the Laboratory of Dynamic Meteorology in Paris. “In fact, essential physical aspects of climate change are poorly understood.”… [U]nderstanding how the warming climate might affect cloud cover, which influences the amount of sunlight reflected back into space and thus Earth’s energy cycle, is key to addressing these uncertainties. A major weakness of current climate models is their limited ability to simulate the convection by which humid air is lifted into the atmosphere and which drives cloud formation and rainfall. In some instances, the models cannot even agree on whether the future will bring more rain or less. Kenneth, why would we use 30-year old values when in a calculation that calls for an instantaneous rate of change? To explain more completely, if we want to calculate the doubling time for a variable, assuming exponential increase at the current rate, we need to know what the current rate is, not the past rate — because we are going to divide that number by the current value. We can express this as a percentage. Dividing this into 72 (rule of 72, just as you would do for compound interest) gives a good approximation of the doubling time. Historical data just doesn’t help with transient response calculations. The Keeling curve (after seasonal variations are removed by doing a 12-month mean) shows a smooth increase, so we don’t need the long-term trend for noise-reduction purposes. And we don’t *want* the long-term trend, either, because it will significantly underestimate the percentage rate of increase, and significantly overestimate the doubling time. Such an error will result in either *overestimating* sensitivity (if estimating sensitivity from the temperature trend) or *underestimating* the temperature trend (if starting from sensitivity to predict the trend). we need to know what the current rate is, not the past rate — because we are going to divide that number by the current value. The “current” rate is defined by whenever you’ve decided to cherry-pick your starting point. It’s relative. The Industrial Era began in 1750. So is 1750 current? No? Why not? And why did the IPCC choose that year? Why do you believe that all the many dozens of scientific papers that show climate sensitivity much lower than Otto et al. (2013) (2 degrees C) are wrong? What allows you to decide that one paper is right and the others wrong? Do you just presume it’s right because it fits with your presuppositions? That’s sure what it seems like. Why would you say 30 years is “a requisite for climate change indicators”, and then use the following statement in your argument: “The rate of warming over the past 15 years (1998–2012; 0.05 °C per decade), which begins with a strong El Niño, is smaller than the rate calculated since 1951 (1951–2012; 0.12 °C per decade)”? If you go back 30 years, the rate is in the neighborhood of 0.15 degrees per decade, plus or minus a few tenths depending on which data set you use. There is a widely agreed figure for no-feedback sensitivity of 1 degree per doubling. The fact that the sensitivity estimated from the 30-year trend is closer to 2 degrees is indicative of positive feedback. These are transient sensitivities; the equilibrium sensitivity is necessarily higher. CO2 has increased nearly 100 ppm since the mid-50s. 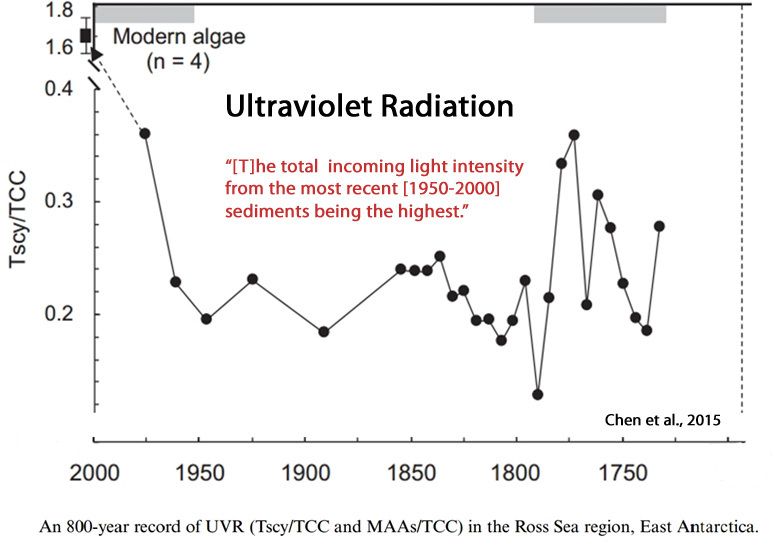 Prior to that, we had only seen about 30 ppm increase since pre-industrial times. I had asked you what year you had chosen to start from to proclaim 2 ppm/yr wrong vs. the “right” rate of 2.3 ppm/yr. Can you answer this question, ScottM? The fact that the sensitivity estimated from the 30-year trend is closer to 2 degrees is indicative of positive feedback. Considering there has been a reduction in cloud cover since the 1980s, and the net radiative forcing from these cloud cover changes is about 5 to 10 times greater than the RF alleged from CO2 concentration changes, why do you believe cloud radiative forcing should be ignored, and thus only the alleged change from CO2 should count in your calculations? Global [surface solar] radiation has an overall positive, and significant, trend [1983-2010] over the Meteosat disk which is mainly due to a negative trend in the effective cloud albedo, i.e., a decrease in cloudiness. Kenneth,how does any of your nonsense refute what I demonstrated, namely that the method of calculation used by the author is flawed? Plug in whatever numbers you think are justified -all I ask is that the calculation be done correctly. temperature response is linear. It isn’t. Logarithmic temperature response dictates that the conversion between temperature sensitivity and rate of temperature change uses a doubling time based on exponential extrapolation of the independent variable. [A] doubling the CO2 concentration in the Earth’s atmosphere would lead to an increase of the surface temperature by about +0.5 to 0.7 °C, hardly an effect calling for immediate drastic changes in the planet’s energy policies. An increase in the absolute air humidity caused by doubling the CO2 concentration and the resulting decrease of the outgoing IR flux would produce a relatively small additional effect due to a strong overlap of IR spectral bands of CO2 and H2O, the two compounds primarily responsible for the greenhouse properties of the atmosphere. [W]e find that the equilibrium climate sensitivity is most likely less than 0.5°C, increasing CO2 most likely caused less than 20% of the global warming from the 1970s, and the CO2 response is less than one-third as strong as the solar response. The conventional model overestimates the potency of CO2 because it applies the strong solar response instead of the weak CO2response to the CO2 forcing. Dangerous anthropogenic warming is questioned (i) upon recognition of the large amplitude of the natural 60–year cyclic component and (ii) upon revision downwards of the transient climate response consistent with latest tendencies shown in Fig. 1, here found to be at most 0.6 °C once the natural component has been removed, consistent with latest infrared studies (Harde, 2014). Including solar and cloud effects as well as all relevant feedback processes our simulations give an equilibrium climate sensitivity of CS = 0.7 °C (temperature increase at doubled CO2) and a solar sensitivity of SS = 0.17 °C (at 0.1 % increase of the total solar irradiance). Then CO2 contributes 40 % and the Sun 60 % to global warming over the last century. As a result, the climate sensitivity for a doubling of CO2 is estimated to be 0.7K (with the confidence interval 0.5K – 1.3K at 99% levels). This observational result shows that model sensitivities indicated by the IPCC AR4 are likely greater than the possibilities estimated from the observations. As may be seen in Fig. 7, a doubling of CO2 increase the mean annual global surface temperature according to our dynamical model by about 0.7K, but a sixfold increase only increases the temperature 1.7K. The nonlinearity is due to saturation of the 15 µm band. It is found that doubling the carbon dioxide concentration increases the temperature near the ground by approximately one-half of one degree [0.5°C] if clouds are absent. A sevenfold [700%] increase of the present normal carbon dioxide concentration increases the temperature near the ground by approximately one degree. Temperature profiles resulting from presently observed carbon dioxide concentration and convective cloudiness of 50% or less are compared with those resulting from doubled carbon dioxide concentrations and the same amounts of cloud cover. Again, it is found that a doubling [100% increase] of carbon dioxide increases the temperature in the lower boundary layer by about one-half of one degree. The short- and long-wave absorption of the most important greenhouse gases water vapour, carbon dioxide, methane and ozone are derived from line-by-line calculations based on the HITRAN08-databasis and are integrated in the model. Simulations including an increased solar activity over the last century give a CO2 initiated warming of 0.2°C and a solar influence of 0.54°C over this period, corresponding to a CO2 climate sensitivity of 0.6 °C (doubling of CO2) and a solar sensitivity of 0.5°C (0.1 % increase of the solar constant). 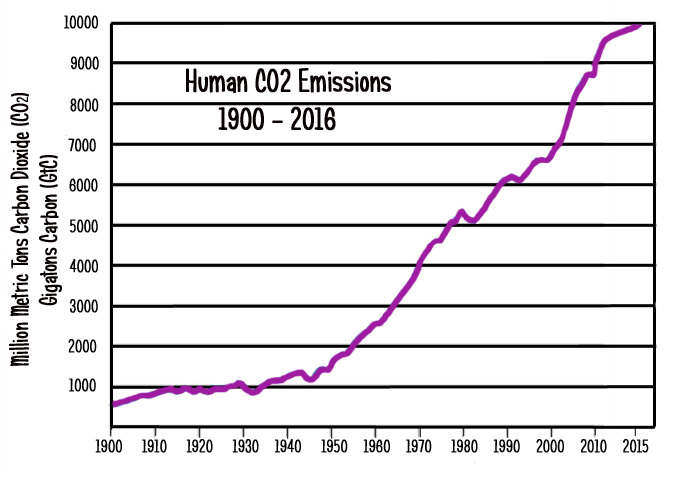 If atmospheric carbon dioxide concentrations have risen by ~110 ppmv since 1881 (i.e., 290→400 ppmv), this would imply that carbon dioxide (CO2) is responsible for a warming of at most 0.0011 × 110 = 0.12°C over the 1881-2014 period, where 0.0011 is the slope of the line in Figure 29(a). We can use this relationship to calculate the so-called “climate sensitivity” to carbon dioxide, i.e., the temperature response to a doubling of atmospheric carbon dioxide. According to this model, if atmospheric carbon dioxide concentrations were to increase by ~400 ppmv, this would contribute to at most 0.0011 × 400 = 0.44°C warming. That is, the climate sensitivity to atmospheric carbon dioxide is at most 0.44°C. The largest deviation between the ANN [artificial neural network] projections and measured temperatures for six geographically distinct regions was approximately 0.2 °C, and from this an Equilibrium Climate Sensitivity (ECS) of approximately 0.6 °C [for a doubling of CO2 from 280 ppm to 560 ppm plus feedbacks] was estimated. [W]e conclude that the temperature increases predicted by the IPCC AR5 lack robust scientific justification. … A doubling [to 800 ppm] of the present level of CO2 [400 ppm] results in [temperature change] < 0.24 K. … [T]he scientific community must look for causes of climate change that can be solidly based on physics and chemistry. … The observed temperature increase since pre-industrial times is close to an order of magnitude higher than that attributable to CO2. Seb doesn’t “know” anything. He “believes”. That’s why he has no numbers for anything. Showing him numbers just bounces off his belief system. It’s like showing miracle statistics to a Catholic. It’s like showing miracle statistics to a Catholic. SebH must be reputed professor of a well known university. He might want to show his credentials before someone finds out. SebH has studied sciences, has he?